Your local cycle mechanic and bike shop located in Blackhall. 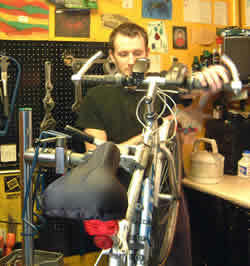 If your bike needs work, bring it in to see Derek. Setting himself apart from many bike shops, Derek offers his customers a choice in the quality of consumables used. Top quality Finish Line greases, lubricants and cleaning agents are included in the price of all services. Additionally, for only £10 per service includes the absolute pinnacle of lubrication products, Shimano Dura Ace grease, costing more than £100 for 500gms. Another unique aspect of Derek's attention to detail is the cleaning included in the deluxe service. At no additional cost, your bicycle will be returned not only running perfectly but looking as good as new. This relentless focus on quality customer service is only one small part of why Derek Laing has been delighting the customers of Blackhall Cycle Repairs since 1994. Derek stocks a wide range of accessories including all the usual gear. Helmets, lights, locks, bottles, pumps, clothing, luggage, safety gear, tools and a range of spare parts and other accessories. Anything not in stock can be ordered in a few days. We carry the whole Ridgeback range of bicycles. For more information on these top quality, affordable, British made bicycles, see www.ridgeback.co.uk. Derek started Blackhall Cycles in 1994 after 10 years in the bicycle service trade. Funded by the Princes Youth Business Trust, Blackhall Cycles has stood the test of time. Derek prides himself on outstanding service. Every bicycle that leaves his shop he's proud to put his name to. Every new bike is carefully assembled, rigorously tested and guaranteed to be in a safe and ridable condition when it leaves the shop. 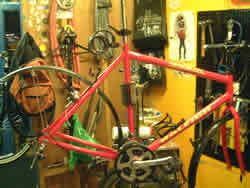 As every previous customer knows, it's Derek's personal service that has set Blackhall Cycles apart for so many years. If you want top quality work on your bicycle at the best possible price, come to Blackhall Cycles.